The popular autumn extravaganza saw 12,074 visitors through the gates at the Great Yorkshire Showground on the weekend (22nd and 23rd October 2016), just shy of last year’s attendance of 12,101. 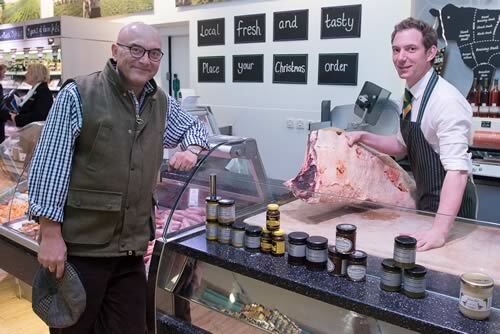 Amongst them was BBC’s MasterChef Presenter Gregg Wallace, the show’s VIP guest, who delighted crowds as he toured the event, officiating at the chefs’ cook off in the new showpiece Cookery Theatre, visiting Fodder, the showground’s shop and café, and presenting prizes to winning beekeepers and tasting Yorkshire-made mead for the first time. Also enjoying the event was Julian Norton, star of Channel 5’s Yorkshire Vet programme who visited Countryside Live’s first-ever Alpaca show as part of his visit. “It’s been a wonderful two days, the standard of the competitive entries has been first class and it’s been great to see families enjoying themselves. Countryside Live was the setting for the finals of the Young Shepherd of the Year competition, organised by the Rare Breeds Survival Trust. Held at the event for the first time. Eleven year old Tom Evans of Fourcrosses, Wales was crowned the overall champion. And the winning team in the Tug of War contest will be heading to Kentucky in February as their success in the World Team Championships at Harrogate means their tickets to participate in the World Shoeing Classic competition are secured. Dates for Countryside Live in 2017 are Saturday 21 and Sunday 22 October, which will be the event’s 15th show. Dates for its sister event, the Great Yorkshire Show are Tuesday 11 – Thursday 13 July 2017. Beef Supreme Champion: a British Blue X heifer, “Black Pudding” owned and shown by Edward and Sarah Layton of Leominster. Beef Young Handler Champion: Jack Bodily of Abergavenny with a 16 month old British Blue x heifer. Sheep Supreme Champion Single Butchers’ Lamb: a home-bred Beltex X shown by Hannah Brown of Leyburn, North Yorkshire. Hannah’s parents, Martin and Val Brown, won the Supreme Pairs Championship, also with Beltex X lambs. Sheep Young Handler Champion: Harvey Heath aged 9 of Ashbourne, Derbyshire with Jack Whiteford, aged 7 of Brampton, Carlisle as Reserve. Talented Show Jumper Winner: 14 year old Katie Tasker of Huddersfield riding “Lights Out” with Lauren Wilmot of Driffield as runner up. Ridden Mountain & Moorland Championship: “Benbreac of Croila” ridden by Matthew Cooper. The 9 year old Highland stallion is owned by Mrs Stanford. Mountain & Moorland Working Hunter Pony Champion: An 8 year old Fell pony, Murthewaite Soloman won the title, ridden by 18 year old Olivia Lyall of Sleights, Whitby. Senior Inter-Relay Team: 1st Horses4Sale – Samantha McNicholas, of Darlington, Polly and Alice Douglas of Durham. Junior Inter-Team Relay: 1st: Bounty Hunters – Billy Luther, 14, of West Bolden, Tyne and Wear, Faye Johnson, 14, and Nicole Greensmith, 15, both of County Durham. Pigeons: Best Fancy Pigeon Championships: Keith and Gill Robson of Darlington. Poultry: An Australorp pullet shown by Mike Evans of Guisborough, North Yorkshire won the supreme championship. Rabbits: Best in Show: a four and a half month old Angora female shown by Adel Wray of Manchester. World Team Farriery Champions: The Jim Blurton Bar Shoes-sponsored Welsh team of Matt Randles, Gavin Golby, Andy Reader-Smith and Jonathan Nunn.